Dot San is a design, model, and manufacturing company that works out of Edinburgh, Scotland. The product design company renders 3D models using software such as Rhino 3D and Maxwell Render to create photorealistic works to be used for marketing, 3D printing and manufacturing purposes. The company works with clientele all over the world and also has their own Etsy shop. I scoped out Dot San’s merchandise on their Etsy page and was thoroughly intrigued by the types of work that they produce. I was particularly interested in the 3D keychains of astrological signs and chemical molecules that they sell. The keychains are all 3D printed out of nylon and steel metals, each one being unique due to the lack of mass manufacturing. The whole initiative is called the “Wired Project” and is centered around the effort to experiment and push the limitations of 3D printing. Dot San creates personal and intricate merchandise that defies the traditionally negative perception of consumerism. I admire that their products are individualized, each one embodying it’s own little quirks, a result of the one time printing process. In addition, Dot San itself – the company and it’s mission is dedicated to testing the boundaries of technology that is currently available to us, something that is essential for advancement and progress. My favorite piece they’ve produced is a standing mini sculpture of the famous Vitruvian Man. It’s an example of classic art done with a modern medium. 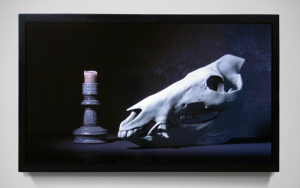 In this piece, Jason Salavon renders in a 17th century Dutch style, a constantly changing in animal skull and candlestick. As the skull evolves though animal type, such as: bear, human, baboon, and boar, the intermediate forms create many interesting fictional hybrids. I really admire the attention to detail, and the way that the transformation of the skull slowly evolves to create so many different combinations of features. I also love the metaphor it serves to animal and human evolution as well as the evolution of art and technology. The allusion to 17th century Dutch art portrayed in a modern medium was super interesting, and provokes a strong sense of evolution in the viewer. This piece is called Zuhal and was created by Neri Oxman and was created in 2014 in Frankfurt, Germany in collaboration with Christoph Bader and Dominik Kolb. I was drawn to this project because it is a beautiful wearable, but the process for creating it was quite unconventional. Inspired by Saturn, the stylistic and color choices reflect the turbulent nature of the planet. 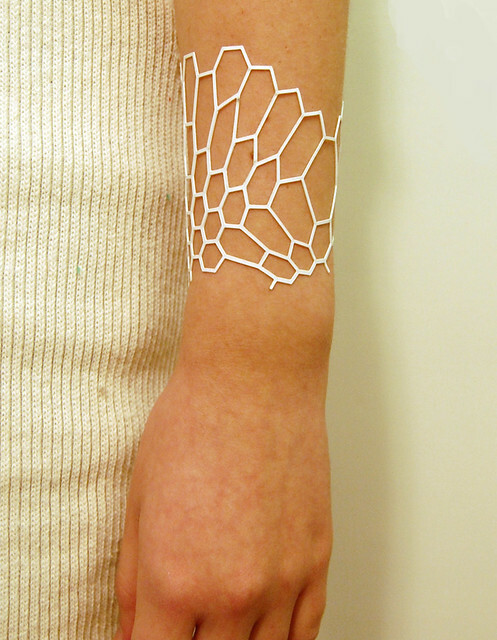 The wearable was created with multi-material 3D printing technology and is an example of a field called Material Ecology, which examines computation, fabrication, and material as one whole body of design. To me, this work represents not only the fields of computation and design individually but is a perfect marriage between these two disciplines. Unfortunately, I was unable to attain more specific information about the steps of this process. 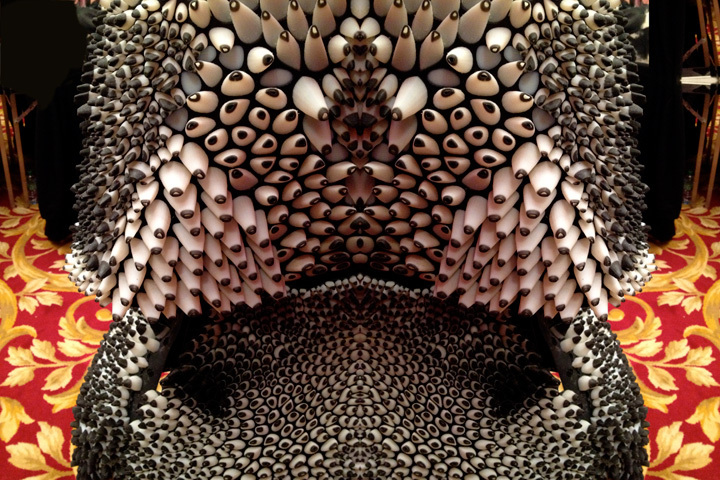 More of Neri Oxman’s work can be seen here. This digitally fabricated object is the most interesting jewelry holder I have ever seen. The creator, who is simply named Jessica on her blog, has been creating digitally fabricated jewelry ever since the scraps from one of her projects was mistaken for it in 2007. She creates these designs herself, therefore fabulously displaying both her technological finesse and her admirable creativity. The only thing said about the algorithms used or how they designed it was that Jesse (presumably Jessica’s partner) used a processing program to develop the holes and connectors for the piece. 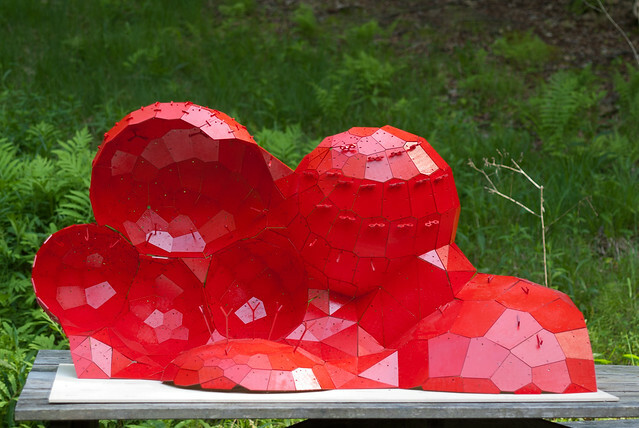 Jessica does also state, though, that they used “a tangent planes method” to create each of the panels that they connected together. Personally I really enjoy the shape and the coloring of this display and, if I had the room for it in my dorm, I would very much enjoy hanging my jewelry on it -perhaps something from Jessica’s collection! A link to her blog about this particular creation is below, and there also is a picture of one of her bracelets that she designed. 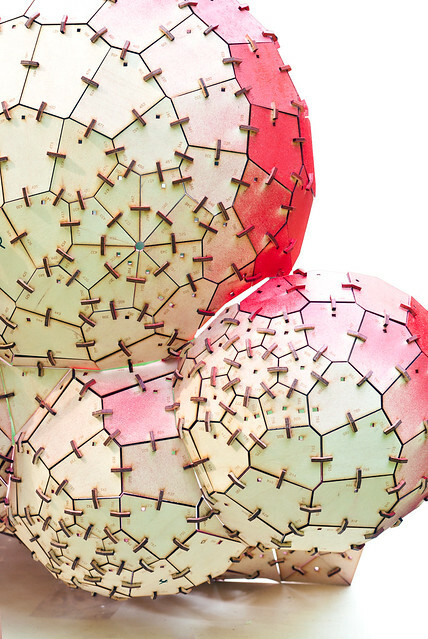 MATSYS Design’s Seacraft Eggs is a piece that came out of a course at the Advanced Architecture Studio at the California College of Arts in 2013. The purpose of this design was to find the relationship between craft and design and use something technical to make it poetic. The artist were inspired by Malcolm McCullough’s 1996 book Abstracting Craft, which covers these topics. 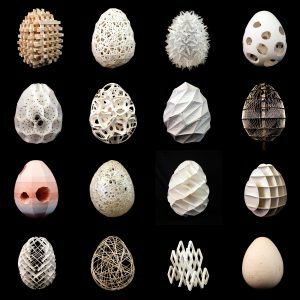 What inspired me about this piece was the fact that every egg is made up of a different algorithm. Although I can not directly identify them, nor could I locate them online, I can see a range of simple polygons and complex lines a used. Although I like the variety of designs, I do think there could have been many many more. The artist I chose is named Josh Harker. 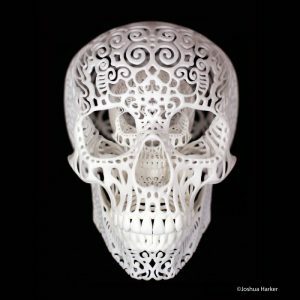 He specializes in 3D printed artwork. I admire the intricate patterns that manifest through his works. I am not sure what algorithms he uses to create these works. His pieces are all delicate and intricate, and show animals, skulls, and human figures. 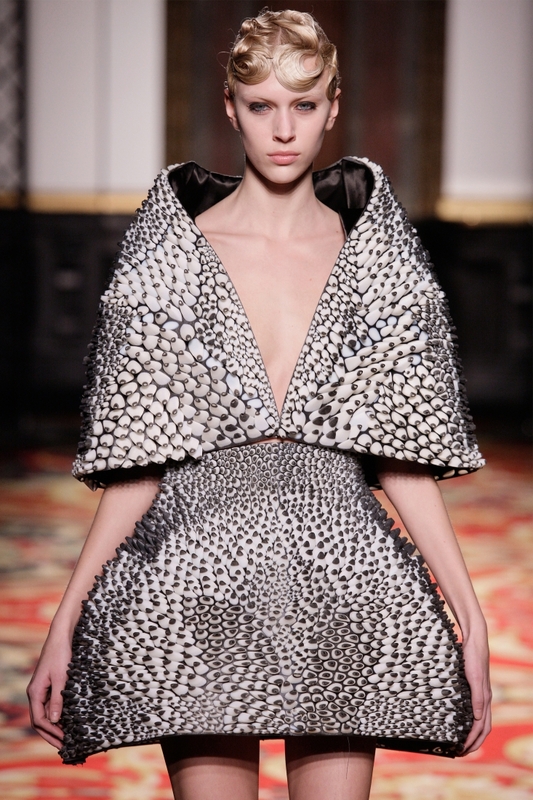 Anthozoa is a 3D printed fashion project created by Neri Oxman and fashion designer Iris Van Herpen. It is debuted in the 2013 Paris Fashion Week. I admire how this project represent technology infused art, especially that fashion is a highly customized industry, so there must be variables that controls the individual module. The 3D printed skirt is powered by Stratasys’ Objet Connex multi-material 3D printing technology, which allows both soft and hard materials to be printed in a single build. Variables also can be changed in the 3D model to fit on the show model. Oxman incorporated aesthetic values into the project. The skirt and cape are tectonic that they are modular and their orientation and sizes vary. Getting inspirations from anthozoa, Oxman mimicked its form and texture to create creative high-end fashion. 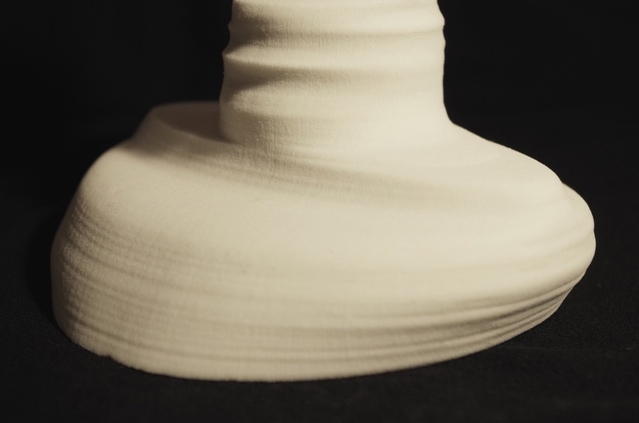 The purpose of this project was not only to print a flexible, wearable 3d dress but also to print it efficiently and all in one piece. They used a physics simulator to “randomly” fold the dress small enough that it could be printed in one large 3D printer. This simulator probably used primary random variables, folding the dress using variables like hinge width and size. Kinetic Dress holds constant its aesthetic which is computer-generated but invokes biological structures and patterns. It’s inspiring because it’s not only a technological feat but an important milestone in the world of fashion. “SUV,” by Dot San, uploaded in 2016. The author, dubbed Dot San, used an online 3D modeler software called “Rhino 3D.” Based on the look of this particular image, as well as some of his other scale models being covered with white grid patterns, I guessed that the technique at work was polygon mesh, a technique in 3D animation where character models’ textures are composed of massive numbers of polygons (the vertices of which can be repositioned) that round out to give an organic shape. To my surprise, this was not the case. Rhino 3D actually uses what’s called the NURBS (Non-uniform rational Basis spline) mathematical model, which calculates precise representation of curves and other freeform surfaces. To be more specific, according to its info page, surfaces generated by NURBS are “functions of two parameters mapping to a surface in three-dimensional space,” the shape of which is “determined by control points” computed by taking a weighted sum of the control points. For some of his works, Dot San has scaled down their size by a selected factor and sent the model into a 3D printer. I imagine he does this so that, with a zoomed in perspective, he can afford more detail to the model which would translate into the printed object. I appreciate this touch of subtlety. Link to specific model in blog post. Link to a Photostream of author’s work. Base of fahz by Nicholas Desbiens. Tick marks show the precise location of each profile. 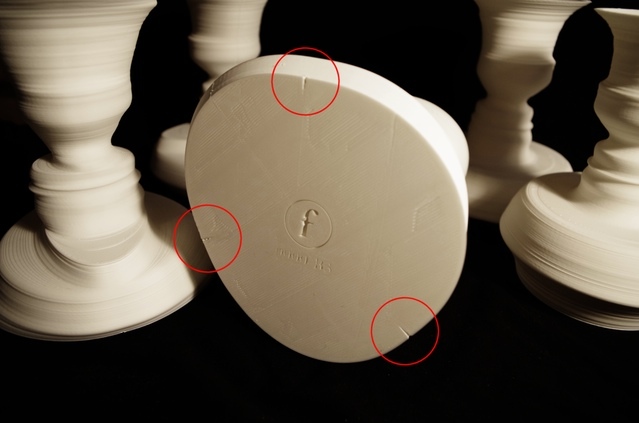 This project was inspired by Edgar Rubin’s Figure–Ground Vase. It is inspirational that coding can bring 2D art from 100 years ago into a customized 3D sculpture today. This Digital Pottery project has now expanded into a business that allows customers to submit profile pictures and get a customized vase. 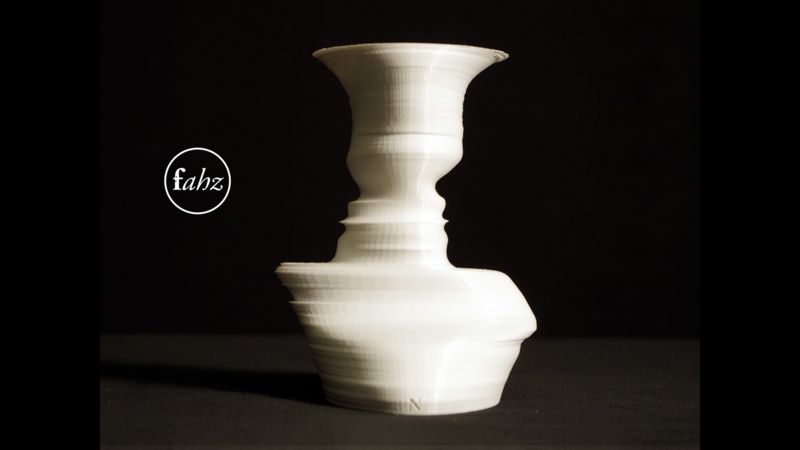 Building on Professor Levin’s idea, each individual vase is already fascinating, but the program that creates infinite varieties of it is priceless.